Political philosophy, perhaps even more than other branches of philosophy, calls for constant renewal to reflect not just re-readings of the tradition but also the demands of current events. In this lively and readable survey, Jean Hampton has created a text for our time that does justice both to the great traditions of the field and to the newest developments. In a marvelous feat of synthesis, she links the classical tradition, the giants of the modern period, the dominant topics of the twentieth century, and the new questions and concerns that are just beginning to rewrite contemporary political philosophy.Hampton presents these traditions in an engaging and accessible manner, adding to them her own views and encouraging readers to critically examine a range of ideas and to reach their own conclusions. 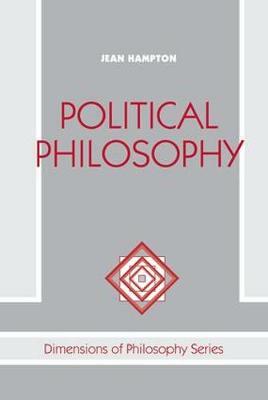 Of particular interest are the discussions of the contemporary liberalism-communitarianism debates, the revival of interest in issues of citizenship and nationality, and the way in which feminist concerns are integrated into all these discussions.Political Philosophy is the most modern text on the topic now available, the ideal guide to what is going on in the field. It will be welcomed by scholars and students in philosophy and political science, and it will serve as an introduction for readers from outside these fields.